What did dinosaurs eat – and how do we know? The Dino Jaws exhibit at the Centre for Life sets out to explore the gruesome, and fascinating subject of dinosaurs and their food. We went to Newcastle to see what it was like, and to find out if the rumours about this exhibit were true. We are annual pass holders at the Centre for Life, and have been since James was aged a little over 1. We’ve seen quite a few exhibits here during our time as regular Centre for Life visitors, and usually enjoy them. Dino Jaws is on loan from the Natural History museum, and we had heard that it was definitely something dinosaur fans would need to see, regardless of their age – if they love dinosaurs, they’ll love this exhibit. That’s quite a big billing. I have a dinosaur fan on my hands. Noah is super keen on dinosaurs! As he is only two years old, we’ve kept him quite sheltered from too many facts about dinosaurs and simply let him enjoy their form (For example at the Brick Dinos exhibit at Woodhorn). I thought we’d give this exhibit a go. 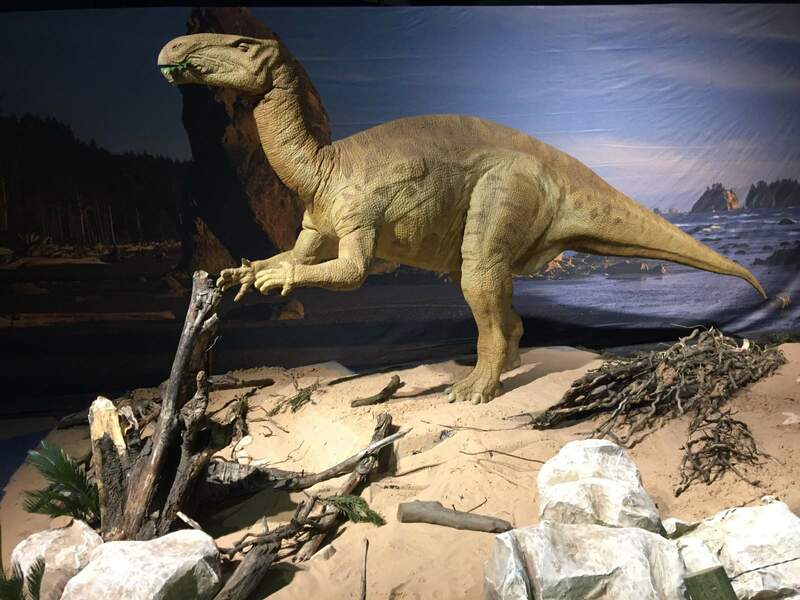 The start of the exhibit is dominated by three life-sized animatronic dinosaur heads showing how the teeth and jaws move together to tear, grind and chew food. One half of each head is covered with skin and the other half shows the skull bone. At this point both boys stopped in their tracks and hesitated about going further into the exhibit. After some encouragement they went and had a look at the dinosaurs, as we could see the grinding jaws and see differences between meat-eaters and plant-eaters. Did you know Brachiosaurus was a herbivore, but its teeth were not very good for grinding plants? Instead its stomach contained stones (gastroliths) to do the grinding work. Nor did I, but that’s the kind of interesting fact you can learn in the Dino Jaws exhibit. There’s an area, close to the entrance to the Planetarium that seems to be most geared to preschoolers. There’s a puzzle to pack a fossil in a crate, as well as a buzz wire loop game. The first was declared “too easy” by James (aged 4) and the second “too tricky”. Noah enjoyed packing the fossil over and over until James was keen to move on in the exhibit. There’s a book in this area that looks quite interesting with cut outs and bold illustrations, but I didn’t get to see what it was about since James just liked to look at the pictures and figure out the story himself. Elsewhere there is a giant touch screen “excavation” area. Using the interactive touch screen you can ‘excavate’ a fossil by tapping on a screen. As these components were engaging yet also educational, it was fantastic to see just how popular they proved to be amongst the children there. I think we’ll have to go back to this one! The biggest draw to the exhibit is the animatronic dinosaurs. I think the concept of the exhibit being focused on dinosaurs food is really interesting. Before we went, I did wonder how different it would be to the moving dinosaurs we saw at the Centre for Life a couple of years ago. But, as there is a specific focus to the display, it is different, and more interesting. I liked to see the huge Baryonyx dinosaur try to catch the fish with its long claws. It was a good trigger for talking abut what dinosaurs eat. There is a little animatronic display of three dinosaurs eating another one. I have to say, Noah was much cooler with this than I anticipated! The Centre for Life website says it will take about an hour to get around the exhibit. I don’t know who they went with when they measured this. Perhaps someone who walked only in tea-leaf footsteps and read absolutely everything in detail. We were in for about 30 minutes, and would’ve been longer except for Noah clinging to me for the first part while James raced ahead. We missed quite a bit due to the (understandable) apprehension of seeing moving dinosaurs and also the excitement of seeing what there was to do and see. Neither of my children was bothered about touching the giant pile of poop, or the fossilised dinosaur poop, but yours might be?! I think the best age for this would be children aged 5 to 11. Primary school, and not really preschool, even though they’ve got a preschool area in the Dino Jaws exhibit. My children are a bit young for this, especially given that they can’t read and I usually visit places like this by myself with the boys. I imagine that a dinosaur fan who can meander through the display themselves and return to their parent reliably at the end would love this. Upstairs in the Under 7s area of the Centre for Life there are dinosaur colouring sheets and a craft to make a dinosaur puppet. James is really into crafting at the moment, and he loved this tricky activity. You can see the end result (held up by Noah) in the video above. Downstairs in the cafe there are cupcakes with dinosaurs on, while in the gift shop there are the usual excellent science-related products as well as dinosaurs. All in all, does the Dino Jaws exhibit live up to the rumour? Will every dinosaur fan enjoy it? I think children aged 5-11 are the target audience. There’s a science/craft activity near the Curiosity Zone, but as it’s marked for over 6s (7s? I’m not sure) we didn’t pay it any attention. There are dinosaur activities for toddlers and preschoolers in the under 7s area upstairs. So while there’s something for everyone it’s worth being mindful that the animatronics might scare younger children. Have you been to the Dino Jaws exhibit in Centre for Life, Newcastle? What did you think? Ginger Sponge and Orange Custard – cooked in the microwave!